The past year has been a busy one for the mortgage world. With 2016 in its final few days, we wanted to compare this year to 2015, and look at any changes year-to-year – something we did with 2015’s statistics this time a year ago. Across the board, mortgage data took mostly positive turns over the past year. Average mortgage rates saw a decline – to be expected with the Fed’s choice not to raise rates – but the average LTV for the year also shrank compared to the year prior. Both of these are in spite of slightly lower average FICO scores, however that difference from a year ago is the most minimal of the three. Moving forward, average rates will likely discontinue their two-year decline, as the Fed has already announced that Fed Funds Rate increases will happen more than once in 2017. 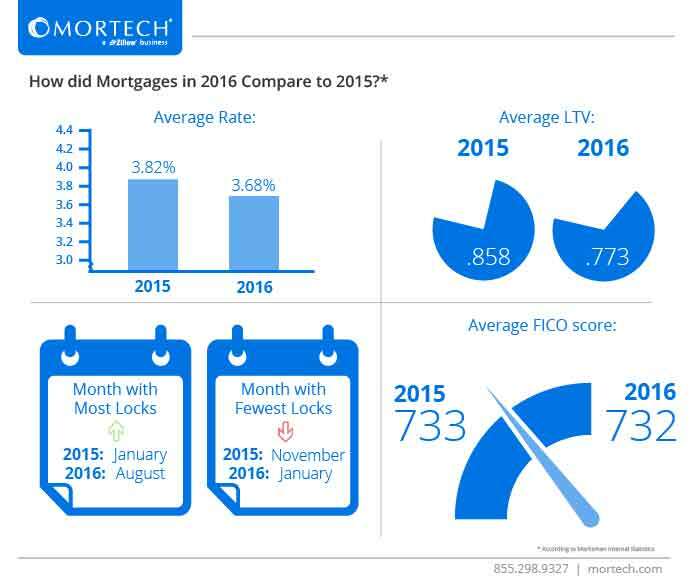 As for months with the most lock activity, January went from first to worst in the twelve-month span, going from the month with the most locks in 2015 to the least in 2016. Meanwhile, August took over the top spot for most locks this year, which would make sense considering that rates were hitting their lowest point before starting to climb again in October and November. As 2017 moves onward, we’ll continue to monitor mortgage rates and data, and see how they compare. But we’ll also continue providing cutting edge mortgage technology and services, ensuring that our customers are always at the forefront of the industry, regardless of what the numbers say. To find out more about the services and tools Mortech can provide your business, contact us today for a short, free demo.